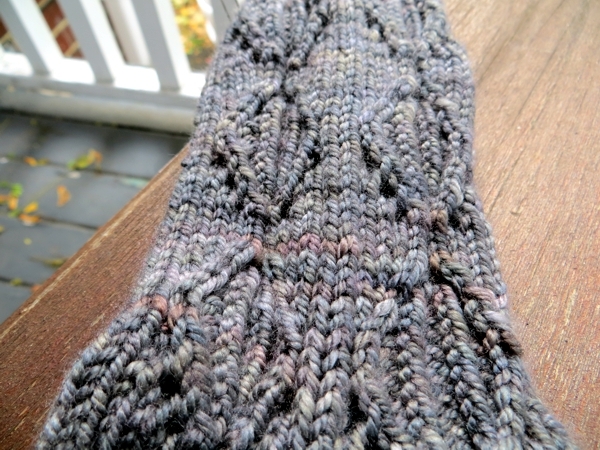 Audiobooks may have led me astray from knitting, but they did lead me straight into finding forgotten knits as I cleared up odds and ends for an excuse to go on listening. 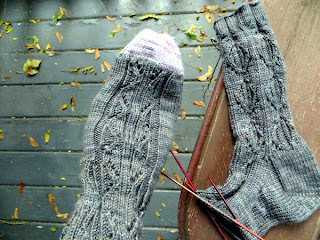 And not just any forgotten knits, but the almost-finished kind. I mean, honestly. What was I thinking? This sock is gorgeous. I remember now why it got put aside - I lost the pattern. Then I found it again about a year later (it was in the tote bag I cart to and from the cottage) but couldn't find the sock. 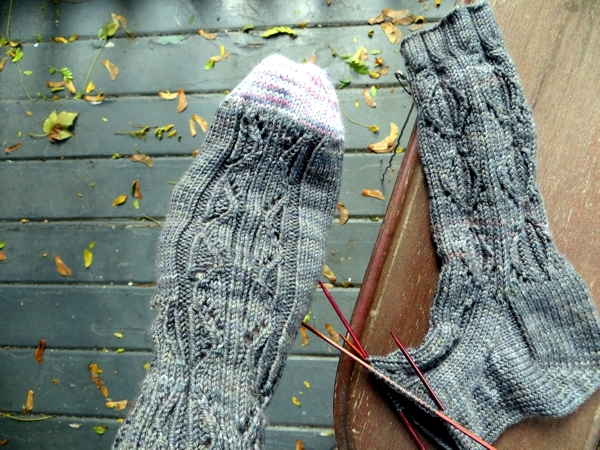 Then I found the sock and put the pattern with it but I must have separated them again a subsequent tidy-up because the pattern that's sitting beside them now is the one I was mocking up for the fingerless gloves I'm still not finished. Fortunately the pattern is my own - I'd been drooling over a lace pattern in a Japanese stitch book - and at last it occurred to me that I can reprint it and get going. The bigger question was: what is the status of Sock #2? I mean, after yesterday's sad discovery of a whole cake of yarn where stitches should be, I was not hoping for much. WOW. 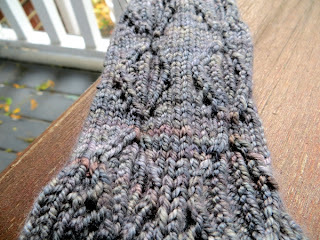 Not just finished, bu the toe grafted shut and all the ends woven in. 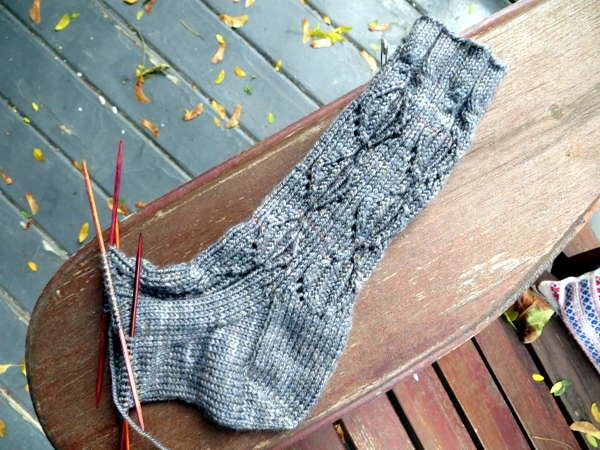 I so need to push through that almost-done sock. Okay, time for some audiobook titles you might like. With audiobooks - for me, at least - it's sadly not just about the story or the writing, but about the voice of the reader. Ever since I accepted that my bookshelf space is now not only rare but practically extinct, a lot of decision-making between audio and electronic edition happens based on voice. These books all do good voice. Millions Like Us - this nonfiction book includes first-person accounts of the British women who lived through World War II. Some of their stories were really inspiring and happy, and others were incredibly sad, like the young woman who lived as a drudge with an emotionally abusive mother and distant father until magically, she met and fell in love with a good man who absolutely wanted to marry her. Almost immediately after they made their plans, his submarine was torpedoed. She met another man later in the war and: same story. Yet she carried on. There are a variety of narrators for the different women and overall, I just found it super interesting. Long though! You're A Bad Man Mr. Gum - this one is not long, at just 1 hour +, and it's a children's book. What it also is: screamingly funny and narrated most awesomely by Kate Winslet. There are more in the series and you will want them. Me Before You - this is a romance novel that pairs a young woman with a quadriplegic man a few years older than her. It's been pretty popular so you may have heard of it or even read it already - I found it very well written and not-put-downable, but also: the voice work was fabulous.The house got really clean in the three days I zoomed through the recording. The Unlikely Pilgrimage of Harold Fry - this is another novel, and technically I can't say much about it because I only just started it. But I'm recommending it anyway because it's narrated by Jim Broadbent who is perfect, and the story is immensely human and well-written. Hope some of this is useful to you, and that you have an exceedingly good day till I see you again tomorrow! Loved the Ocean book. Neil is one of my favorites. Let's get cracking on those socks lady. Time's awasting.